Appia Energy Corp. (CSE:API) (OTCQB:APAAF) (FSE:A0I.F) (FSE:A0I.MU) (FSE:A0I.BE) (the “Company” or “Appia”) is pleased to provide the analytical results from an initial heavy mineral sand study (the “Study”) completed on the Alces Lake Property (the “Property”) in northern Saskatchewan. Appia Energy Corp. (CSE:API) (OTCQB:APAAF) (FSE:A0I.F) (FSE:A0I.MU) (FSE:A0I.BE) (the “Company” or “Appia”) is pleased to provide the analytical results from an initial heavy mineral sand study (the “Study”) completed on the Alces Lake Property (the “Property”) in northern Saskatchewan. The Study location is 2.3 km north of the world-class high-grade rare earth oxide (“REO”) Alces Lake outcrops. For the Study, a total of 6 samples were collected from black heavy mineral sand surface layers along a 500 m shoreline of Alces Lake and analyzed for their rare earth element (“REE”) concentrations and mineral concentrations (relative to 100% of the total minerals per sample) (Figures 1 and 2, Tables 1 and 2). Each sample was processed by means of magnetic separation followed by grain size sorting to create 4 distinct sub-sample combinations; ferromagnetic and non-magnetic with grain size <0.25 (0.01 mm to 0.25 mm) or grain size >0.25 (0.25 mm to 1.0 mm). Three REE-bearing minerals were identified in the non-magnetic sub-samples; monazite (average 0.80% concentration), xenotime (average 0.24% concentration), and zircon (average 3.14% concentration). The Study clearly shows that first-pass magnetic separation concentrates both monazite and zircon into the non-magnetic sub-sample, whereas xenotime remains equally concentrated regardless of magnetic separation or grain size distribution. The non-magnetic sub-samples are approximately 10 times more concentrated with respect to Total REO (average 0.386 wt% Total REO) than the ferromagnetic samples (average 0.041 wt% Total REO). 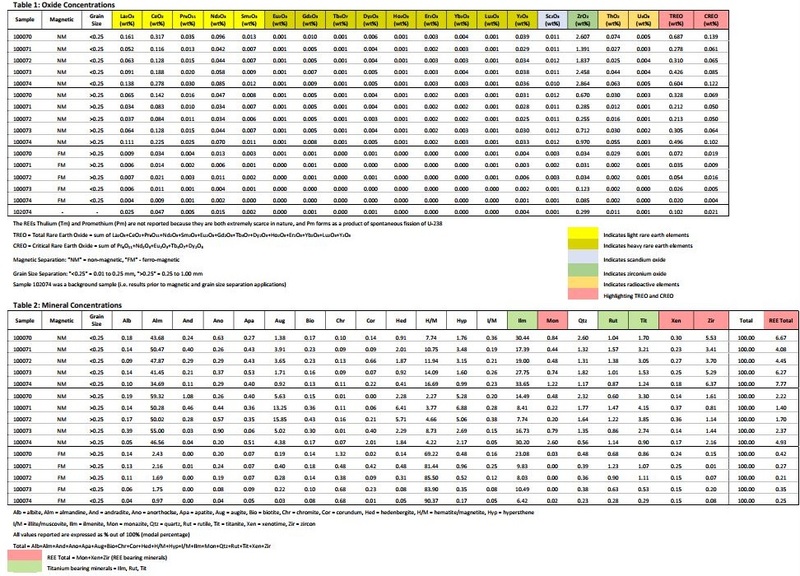 The ratio of the individual REOs to Total REO in all four sub-samples are roughly the same. 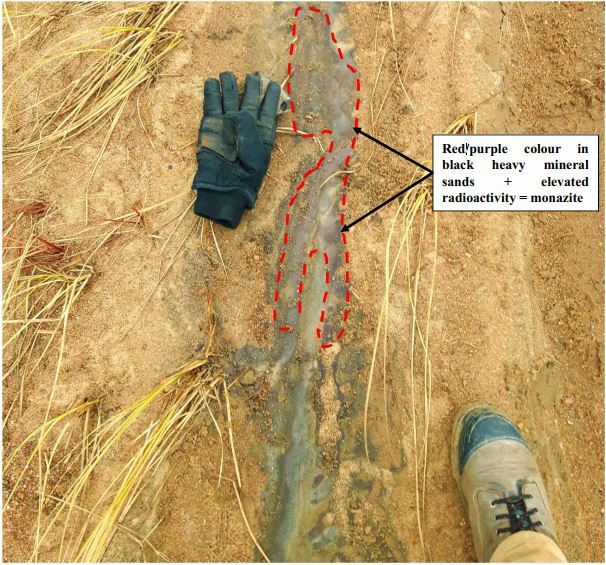 The Study also revealed the presence of scandium (0.011 wt% Sc2O3) concentrated within the non-magnetic samples, and the sand samples are significantly enriched with heavy REEs (“HREEs”) with respect to the high-grade monazite outcrops (i.e. 14.4% HREEs in the sands vs. 3.1% HREEs in the outcrops). Scandium is believed to be sourced from zircon, whereas the HREEs are believed to be sourced from xenotime, a well-known HREE host mineral. The remaining light REEs are interpreted to be sourced from monazite. 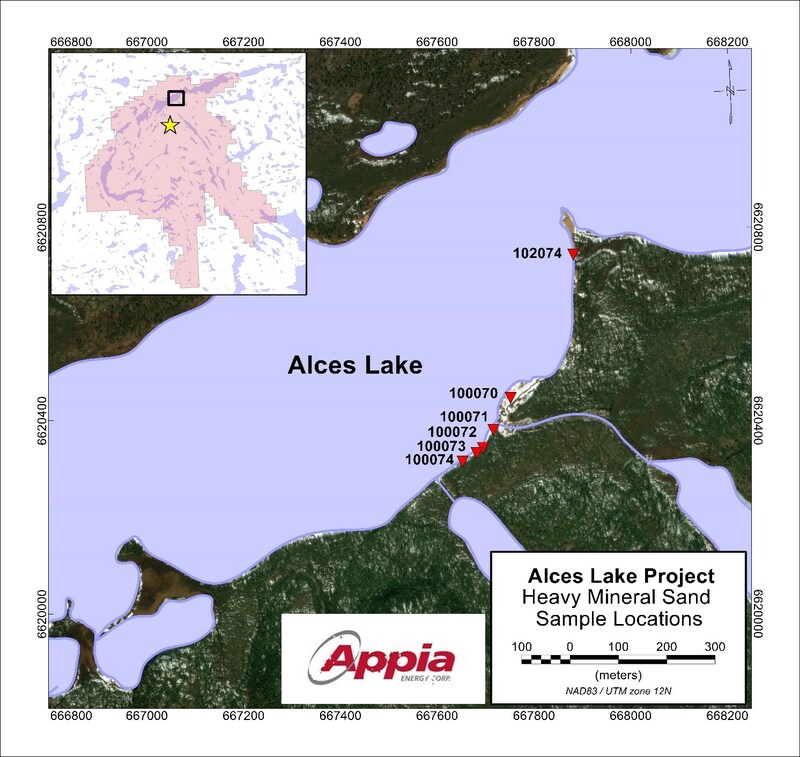 Appia plans to continue diamond drill exploration on the Alces Lake property in June with a 3,000 m program designed to delineate the currently known REE zones, as well as testing other high-priority target areas. The planned drilling program will be carried out concurrent with a detailed ground gravity survey exploring for subsurface REE zones. The Company will continue surface stripping and sampling of other high-priority outcrops, as well as continuing the heavy mineral sand Study of Alces Lake. The Alces Lake Property encompasses some of the highest-grade total and critical REE mineralization in the world**, hosted within seven surface and near-surface showings that remain open at depth. Critical rare earth elements are defined here as those that are in short-supply and high-demand for use in permanent magnets and modern electronic applications (i.e: Neodymium (Nd), Praseodymium (Pr) and Dysprosium (Dy)). The Alces Lake project area is 14,334 hectares (35,420 acres) in size and is 100% owned by Appia. All sample analytical and modal mineralogy results were provided by Saskatchewan Research Council’s (“SRC”) Geoanalytical Laboratory, an ISO/IEC 17025:2005 (CAN-P-4E) certified laboratory in Saskatoon, SK, for multi-element and REE analysis. Modal mineralogy results were obtained from QEMSCAN back-scattered electron images and semi-quantitative point chemical analyses. All analytical results reported herein have passed rigorous internal QAQC review and compilation. The technical content in this news release was reviewed and approved by Dr. Irvine R. Annesley, P.Geo, Advisor to the Board of Directors of Appia, and a Qualified Person as defined by National Instrument 43-101. **Note: The Alces Lake REE grades were compared with global REE deposit grades. The global REE deposit information was derived from publicly available information as of January 31, 2018, from individual company websites, SEDAR technical report filings, and the Technology Metals Research Advanced Rare Earth Projects Index (http://www.techmetalsresearch.com/metrics-indices/tmr-advanced-rare-earth-projects-index/). Appia is a Canadian publicly-traded company in the uranium and rare earth element sectors. The Company is currently focusing on delineating high-grade critical rare earth elements (“REE”) and uranium on the Alces Lake property, as well as prospecting for high-grade uranium in the prolific Athabasca Basin on its Loranger, North Wollaston, and Eastside properties. The Company holds the surface rights to exploration for 64,045 hectares (158,259 acres) in Saskatchewan. Appia has 64.0 million common shares outstanding, 84.4 million shares fully diluted. Cautionary Note Regarding Forward-Looking Statements: This News Release contains forward-looking statements which are typically preceded by, followed by or including the words “believes”, “expects”, “anticipates”, “estimates”, “intends”, “plans” or similar expressions. Forward-looking statements are not guarantees of future performance as they involve risks, uncertainties, and assumptions. We do not intend and do not assume any obligation to update these forward-looking statements and shareholders are cautioned not to put undue reliance on such statements. Neither the Canadian Securities Exchange nor its Market Regulator (as that term is defined in the policies of the CSE) accepts responsibility for the adequacy or accuracy of this release. Figure 1: Heavy mineral sand sample location map. Sample locations cover 500 m of shoreline. Background main image is satellite imagery. The inset shows Alces Lake property (pink polygon), lakes (blue polygons), Alces Lake high-grade REO outcrops (yellow star) and black square is zoomed in the area of the main figure. ALX Uranium Corp. Signs Close Lake Option Agreement with Orano Canada Inc.